Not too long ago I was fortunate enough to attend a dinner featuring the wines of Noël Verset. The company was great, and so were the food and the wines. But this was truly a special experience because Noël Verset's wines are no longer being made - they are quite rare, and are increasingly expensive when they can be found. 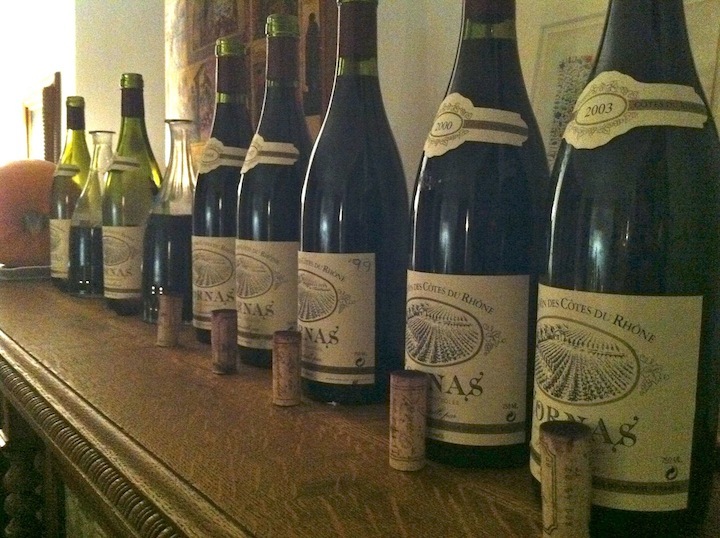 To enjoy a dinner at which 10 different vintages are served...this is not something that can easily be repeated. Jaime Wolff of Chambers Street Wines hosted, and he and David Bowler organized the wines, mostly. The rest of us brought along a bottle and we cobbled together a vertical that spanned 10 vintages between 1988 - 2004. Noël Verset made wines in Cornas that for many people define the potential greatness of the Northern Rhône and of Syrah. I cannot give you a scientific treatise on why Noël Verset's wines are so great, but I can share a bit with you of what I've learned from reading the interwebs and listening to educated people. Verset owned several choice plots of very old vines (some approaching 100 years old) in the best vineyards of Cornas, the tiny appellation in the southern-most edge of the Northern Rhône. He grew an old Syrah clone called La Petite Syrah, a clone known for aromatic complexity. He worked the vines himself until he was over 80 years old, and these are steep terraces, not easy. He began working in the vineyards of Cornas when he was 12 years old in the 1930's, so he knew a little something about growing grapes in this place. Verset did not de-stem the grapes and supposedly crushed them by foot. He was exacting in the vineyards and intelligent in the winery. 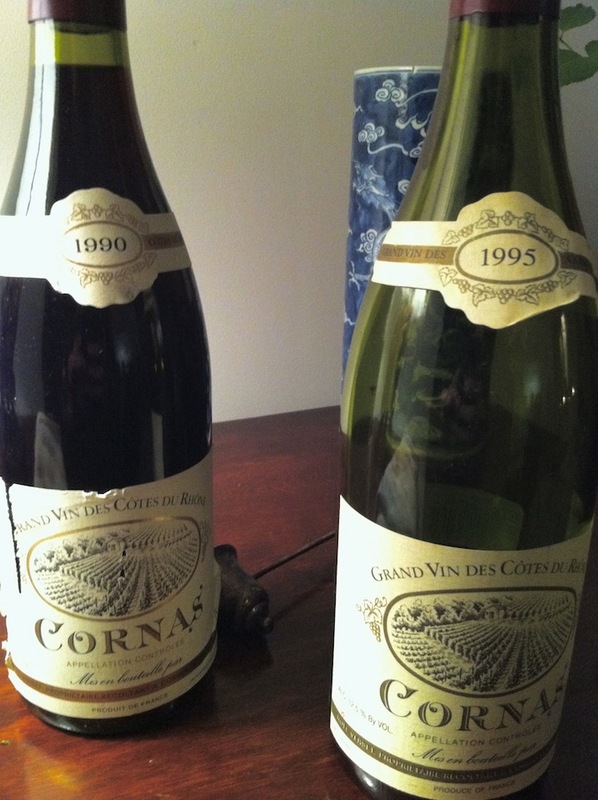 Verset made one wine and one wine only, combining the grapes from all of his parcels into one Cornas. I think it's interesting to think about that. We tend to value the idea of vinifying individual plots separately, as in Burgundy, and increasingly now in Champagne. 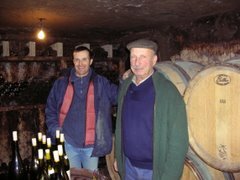 Thierry Allemand makes vineyard specific Cornas, Auguste Clape made several wines from vines of different ages. Not Verset - everything that he selected in a given year went into his one wine. Jamie was a truly gracious host, and made an excellent dinner, as usual. Stirring risotto makes him happy. Could it really be that simple - great terroir, old vines, great plant material, good vineyard work, intelligent wine making? Maybe, maybe not, but Verset's wines stand apart from the black sea of ultra-concentrated, false Northern Rhône wines that make up the majority of what's available today. Verset's wines smell and taste right, like the essence of Syrah from that part of the world - Meaty, savory, funky, darkly fruited, olive-y, and vibrant with minerality and acidity. I love how the best bottles show an incredible intensity and focus while retaining every aspect of definition and clarity - these are big wines, and they are graceful and articulate too. 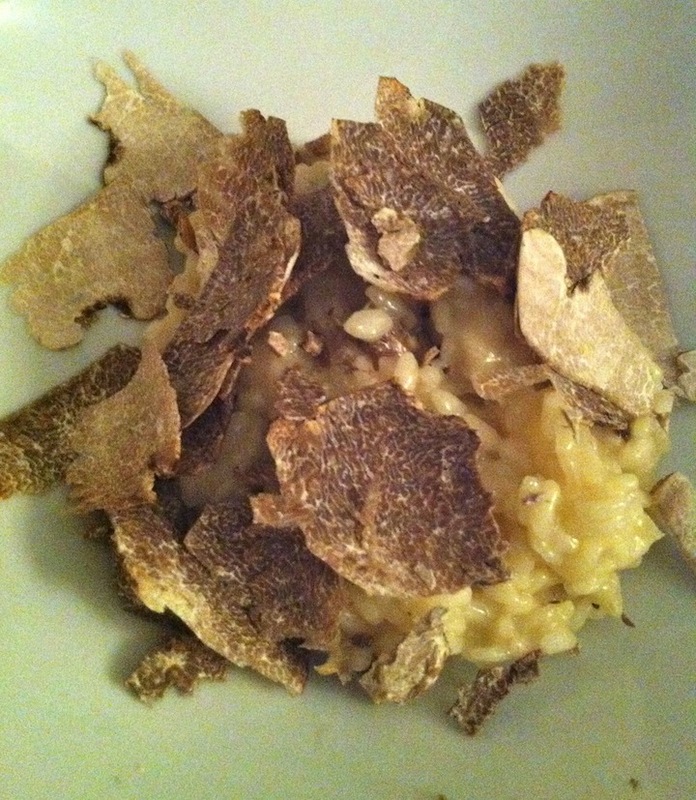 Jamie made, um, white truffle risotto. We drank the older vintages with it. It might seem strange, but I really enjoyed this. Jamie made some delicious things to eat with these wines, and he and David did something that surprised me, but in retrospect it makes perfect sense. They served the oldest wines first. In my (limited) experience, people tend to begin with the young wines and serve the oldest wines last. Young, tannic, acidic Northern Rhône Syrah might be best served after the more delicate and gentle mature wines. With Verset, you get what the vintage gives - the wines are all quite different from one another. Some of these are wines that I've had before, others not. Some seemed to be in a prime drinking window, others were very young. I thought that the 1999 was the most perfect of the wines, objectively speaking, although it was clearly not mature enough to be at its peak. But it was a complete wine, with powerful fruit, minerals, great structure, intensity, and balance. It should be a thing of incredible joy and beauty in 10 years. The 1988 and the 1993 were both compelling and wonderful wines, and both were ready for drinking in that the harder edges of structure had melted into the wine, and both wines showed a delicate side that accentuated the clarity of mature fruit and stony base. 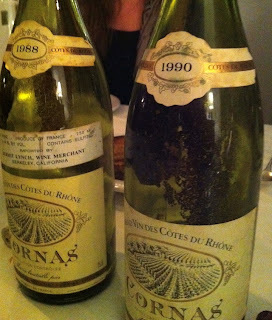 The 1988 in particular was a terrific wine, so classy and graceful, so expressive, perfectly seamless. My favorite wine for drinking on this night was the 1998. 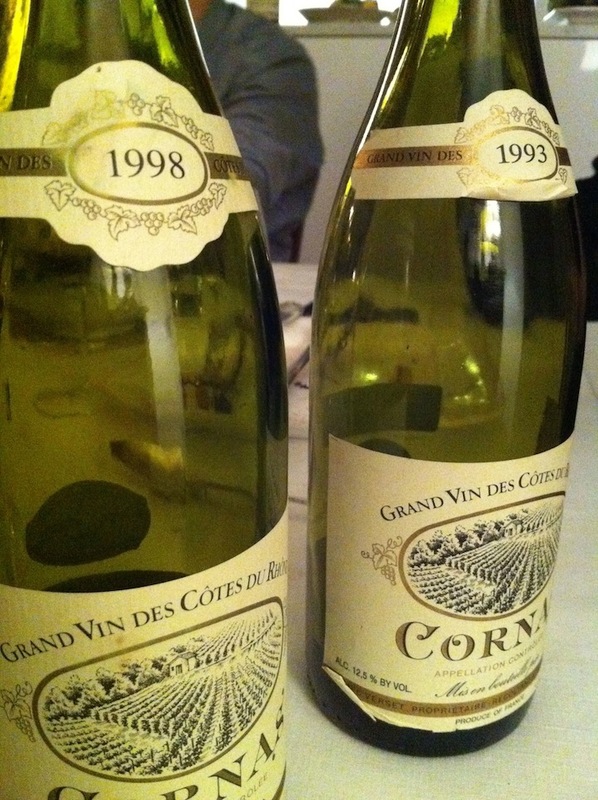 To me, it showed a bit of the power and intensity of the 1999 and also the grace and harmony of the more mature wines, and it was utterly delicious in a riveting way. The 1995 was a controversial wine, at least for me. I was perhaps the only person at the dinner who did not think it as one of the top wines of the night. For me it was too powerful in its fruit and didn't have the grace and elegance that my favorite wines showed. You understand, of course, that I think the wine was great! It just wasn't stylistically the thing that I love about Verset. The 1990 also - everyone loved it and I appreciated it very much also, it's incredibly savory and autumnal tones were lovely. But I guess what turns me on most about Verset is when the wine has nothing sticking out, when everything harmonizes and it's about the sum, not the parts. I enjoyed the 1997 and the 2000, but I have had both of these wines before and enjoyed both vintages more on those other occasions. Who knows, perhaps they just didn't shine in this illustrious company. 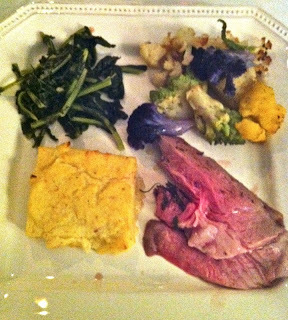 Jamie served roast lamb, polenta, cauliflower and kale with the young wines. Delicious. I read that Verset sold his vines to Allemand, Clape, and a few others after the 2000 vintage, yet there is Verset wine in each of 2001-2006. Are the wines up to the usual Verset standard? Seems like it, yes. I didn't care for the 2003, although I recognize that it is well made wine. The vintage was hot and ripe, and so is this wine - hot, opulently fruited, exotic, completely different from all of the other wines. 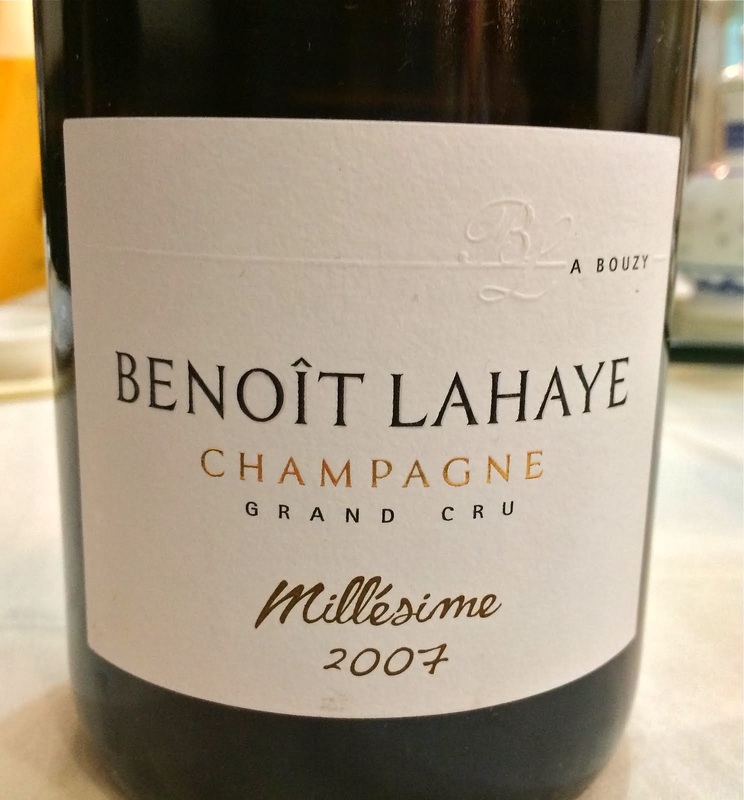 The 2004 was completely lovely, however, with clarity of fruit and mineral, and hinting at the same quiet intensity and harmony that makes some of the older wines so attractive to me. Thank you Jaime and David, and the other Verset comrades. This was a remarkable experience, and I'm glad I was a part of it. 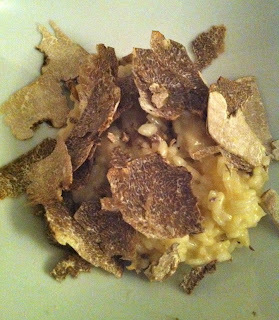 And I'm not just talking about the risotto, I really enjoyed the wines too. Here are my actual tasting notes, for the masochistic among you. Instead of trying to write about individual visits, I thought it would be fun to summarize a bit and share some highlights. Emilio Hidalgo was my first visit to a Sherry Bodega. 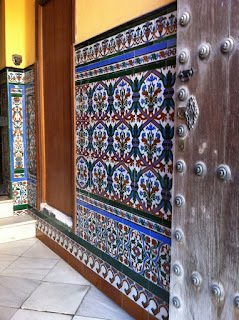 I find it hard to remember the details of a first visit - my senses are always so overwhelmed by the newness of it all. A few things stick out in my mind, however, when I remember the Hidalgo visit. Fernando Hidalgo was our guide, and he and Peter caught up a bit as we walked though the courtyard and into the Bodega - Peter had last been in Jerez in May. 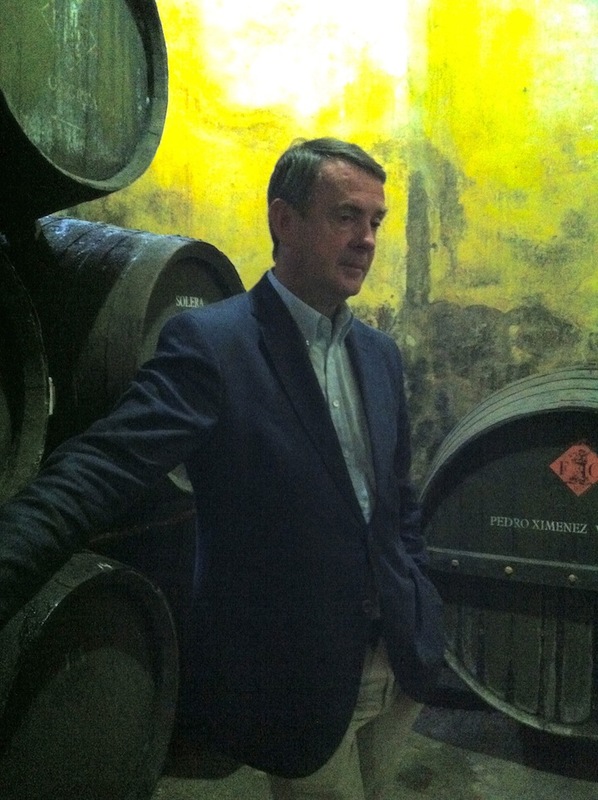 The first wine that Fernando poured for us was the very special old Fino called La Panesa, and as he was about to draw wine from a barrel he said "Wait, this is the barrel you tasted last time, Peter. We should taste another barrel." This is impressive. 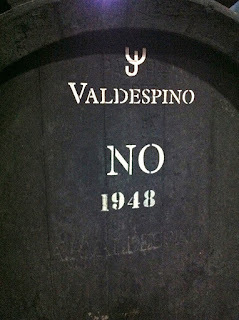 There are obviously many barrels of La Panesa and to remember from which one a rather quiet journalist tasted many months prior...well, it shows an attention to detail and an immersion in one's work that I think is reflected in the wines in general. 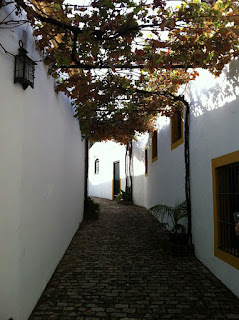 We tasted several barrels and then walked out of one Bodega and into another. These old barrel parts lay in a courtyard outside of another Hidalgo Bodega. 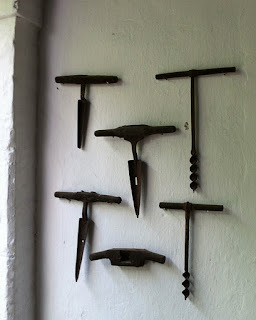 Between this and the tools above, I began to feel as though I better behave myself at Bodegas Emilio Hidalgo. 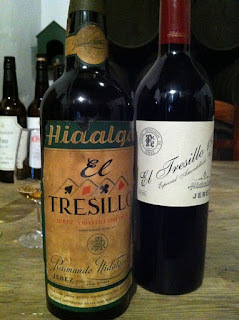 In the tasting room we sampled several wines from bottle, including the miraculous old Amontillado called El Tresillo. How cool is that old label? This is one of many great wines I drank that is not available in the US, to my knowledge, a real shame. Bodegas Tradición is barely over 10 years old, very new for a Sherry producer. The wines, however, are much older. 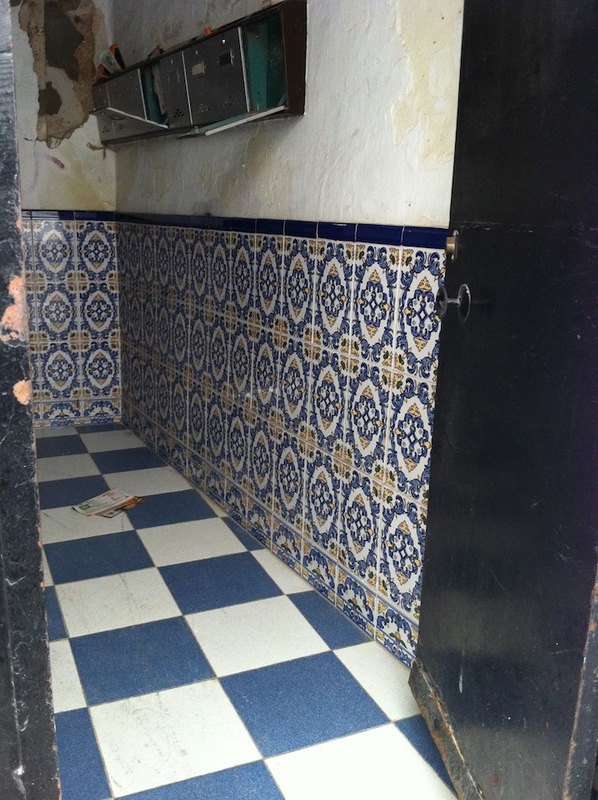 An old Bodega along with wines of very high quality was purchased by a group including billionaire Joaquin Rivero Valcare. Here is a blog post that describes this story in more detail. We walked through the facilities and I was fascinated by the guy wax-sealing the bottles. 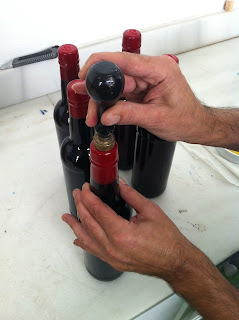 I suppose this is something that happens at wineries all over the world, but it was nice to realize that every bottle of wine that leaves Tradición is sealed in exactly this way. This is a paper filter. 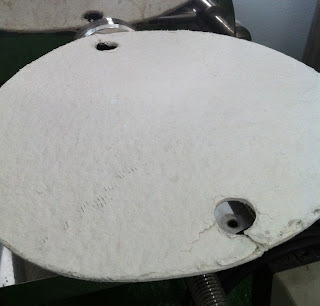 They are stacked together, separated by porous plastic, and this is what some producers use to filter their wines. I was surprised to learn that this is among the most gentle of filtering techniques. How could that be gentle, wine having to work its way through many layers of plastic and something that feels sort of like paper mâché? Everything is relative, I guess. Before going to the tasting room to sample the wines, we visited the museum. 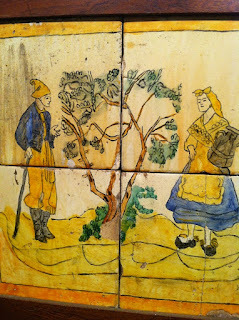 Yes, that's right, there is a museum in the Bodega, filled with master works owned by Mr. Rivero Valcare. 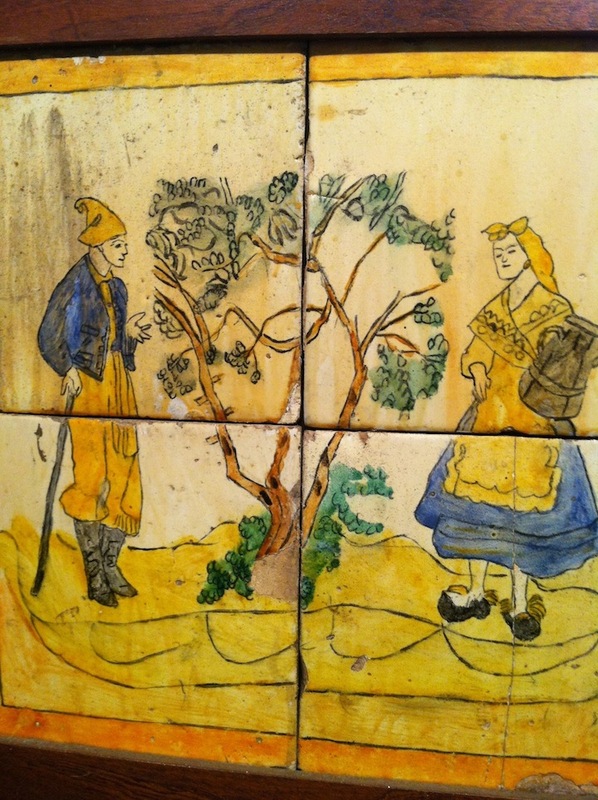 The above tile painting is by Picasso at age 8. We tasted Tradición's four Sherries, a 1975 vintage Oloroso, and their brandies too. I like these wines very much, particularly the Amontillado and the Palo Cortado - another wine that is not available in the US. Peter already described the incredible tasting of the Palmas at González Byass. Another highlight for me at Byass was tasting a barrel of Amontillado wine of indeterminate age, but at least 100 years old. The wine was undrinkable, and Antonio Flores said as much before we tasted it. After enough time in barrel, a wine takes on so much tannin from the wood that it becomes difficult to drink. That said, this wine could be bottled and sold as perfume. 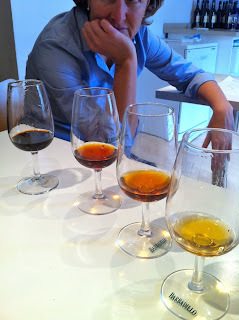 I also learned here to rid myself of preconceived notions about the value of mass produced Sherries like Tio Pepe. I'm not saying that I'm stocking up on Tio Pepe, but it is wrong to think that this is bad wine - it is not. González Byass is a grand old Bodega and they have the resources to make very high quantities of Tio Pepe, and quality is consistent. There are other basic Finos that I much prefer, but I would gladly drink Tio Pepe if those are not available, and I think it stacks up pretty well against most of the world's $12 wine. Fernando de Castilla is a small Bodega making high end Sherries. 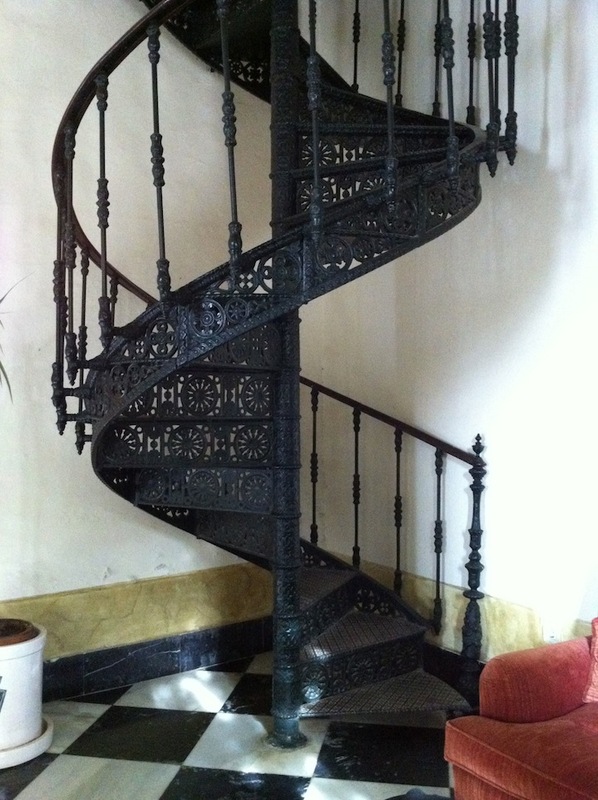 Jan Petterson is a Norwegian who worked for decades at Osborne, and left to take over this gem of a place. I was struck by the fact that he would not pour us samples of his Antique Fino. "I am completely obsessed with flor," he said. "We are very small, and I will not disturb the flor like this. We are entering the season where flor is very delicate and I don't want it to experience any more stress than is necessary." I must say, I admire his dedication to his wines. The wine in bottle was lovely, but a bit confusing to me. It is an old Fino, like Inocente or Panesa, and it is higher in alcohol (18%?) 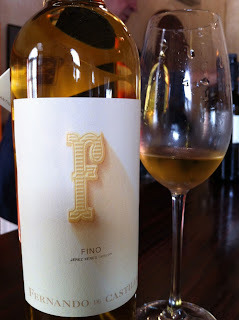 than any other Fino I can think of, and I felt it just a little bit on the palate. Or was it the power of suggestion? I wish I could drink it again, but none of Fernando de Castilla's wines are imported in the US. I brought home a bottle of the very special Antique Palo Cortado and I would invite you to taste it with me but alas, I already drank it. 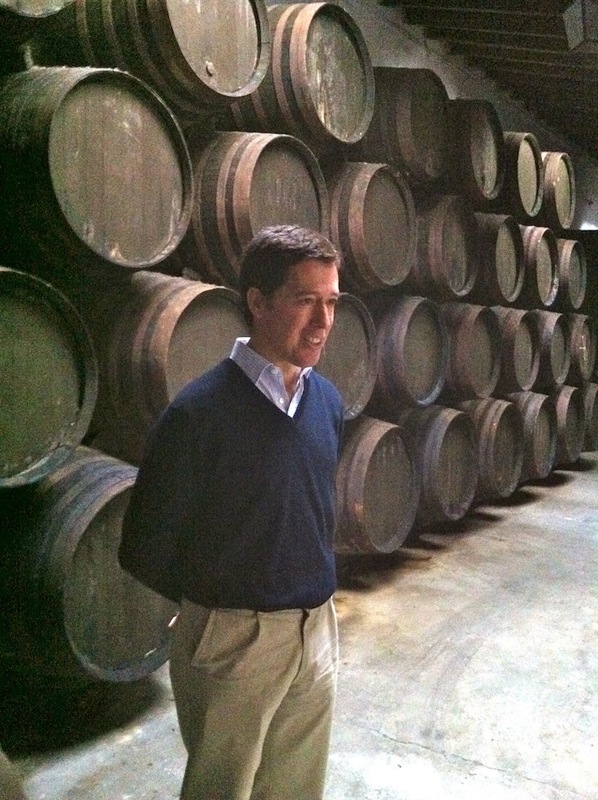 Perhaps the highlight of this visit, for me, was tasting Fernando de Castilla's brandies from barrel. We tasted Brandy in its youngest incarnation, throughout the next decade of its life, and then the final product before it is bottled. I actually loved the youngest wine - it reminded me of eau-de-vie in its powerful and delicious fresh fruitiness - it smelled and tasted of ripe pears. Our Barbadillo visit was also fascinating. First of all, the wine maker is a woman, which is highly unusual in this part of the wine making world. Her name is Montse Molina and she is originally from Madrid, I believe. 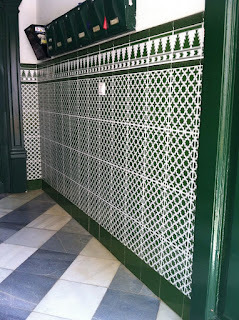 So in addition to being a woman, she is also an outsider in Sanlucar, which I imagine must have made it difficult for her in the beginning with the group of men she supervised and collaborated with in making Barbadillo's wines. 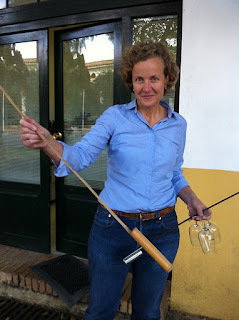 We tasted three barrels of Barbadillo's Manzanilla Pasada, each from a different room within one of the Bodegas. These three rooms differed in size, ventilation, and humidity - they produce entirely different wines, in other words. 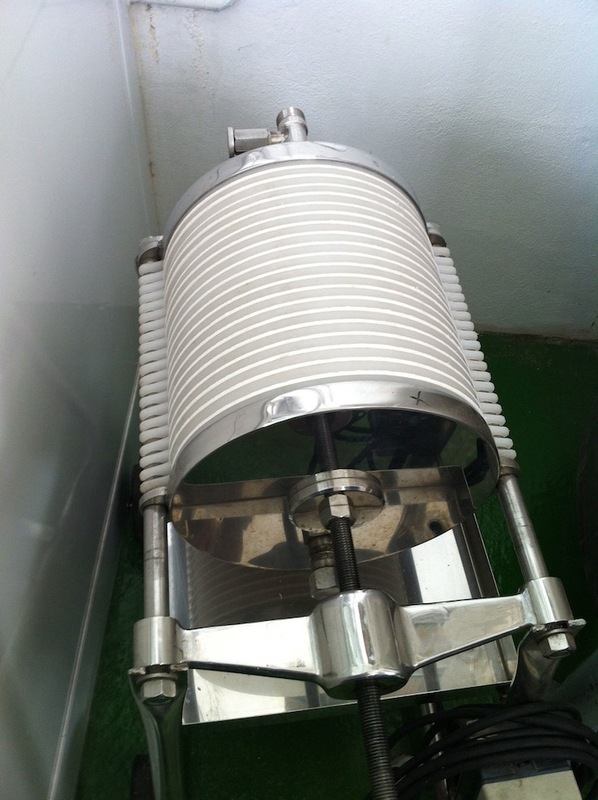 They are eventually blended in order to produce the Manzanilla Pasada that goes into bottle. It was fascinating to taste these three wines in succession, to get a concrete view of the impact of the environment of a Bodega on the barrels of wine it produces. Peter and I took our glasses and blended the three wines in what we thought would be an advantageous way, and it was good. Montse tasted our blend and smiled the way I sometimes smile at my two year old when she is able to get her coat off by herself. 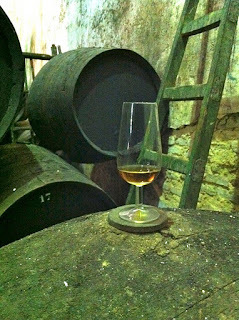 We tasted an old Amontillado and it became instantly clear to me that Amontillado made from Manzanilla is different from Amontillado made from Fino. One is not better than the other, but Manzanilla Amontillado, or at least the few that I've tasted, can have a certain saline and lemon peel brightness that I think is tremendously delicious. These are not easy to find, but worth a special search, if you're into Amontillado. I would suggest that you try Barbadillo's version, which I loved, but it is not imported in the US. And we tasted the Reliquias. 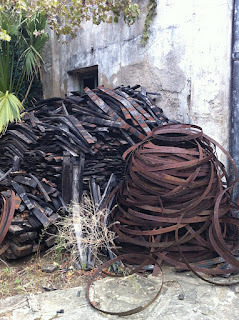 These are very old wines, relics, if you will. They are some of the most expensive and rare Sherries, and Barbadillo literally keeps the room where the Reliquias are served under lock and key. And there was some confusion about the location of the key - several workers were sent scurrying about to search for it. Finally it was located, no one was hurt, and in we went. It would be pointless to try to describe the smell and taste of wines as complex as these, but I can tell you that I have never ever tasted an Amontillado as impossibly light and pungent and balanced and beautiful as this one. 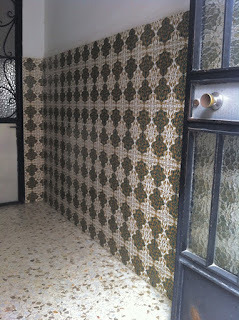 What can I say about visiting La Guita and Valdespino with Eduardo Ojeda? Anything I say will trivialize the actual experience of being there with him, listening to him discuss the wines, the Bodegas, the region. 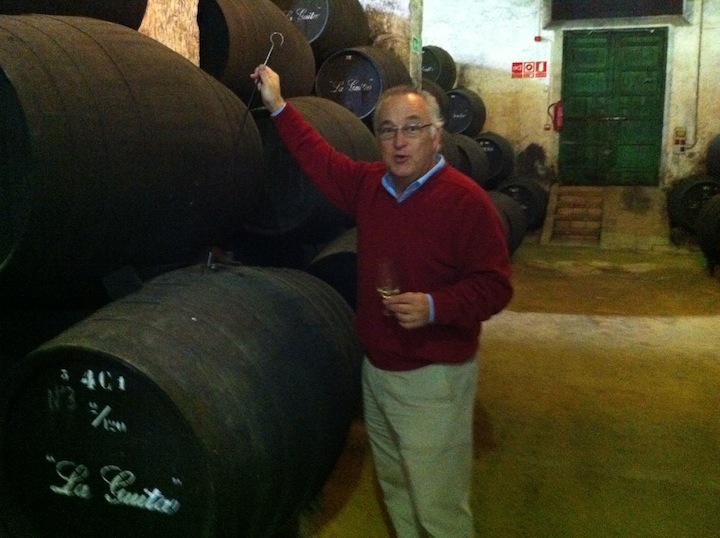 He is a passionate, intelligent, an absolutely gentlemanly and lovely person, a living treasure of the wine making tradition in Jerez and Sanlucar. If you go and visit the region, find him and visit La Guita and Valdespino. At both La Guita and Valdespino, Eduardo wanted to show us the progression of the wines from their youth to the Solera, ready to be bottled. This was an incredible experience for me, seeing the wine in various stages of its life. 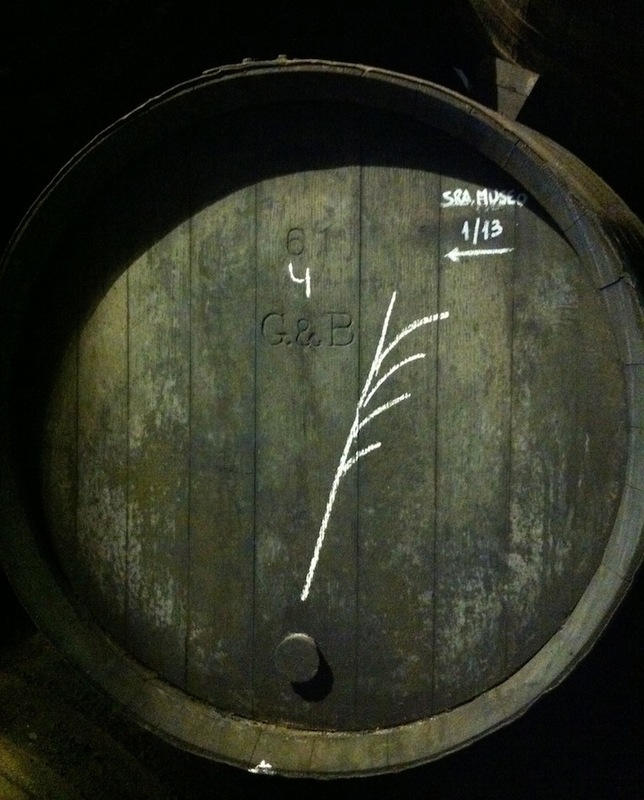 At La Guita we tasted a special barrel, barrel No 3 from the 4th criadera that was just lovely - bright, saline, refreshing, intense. 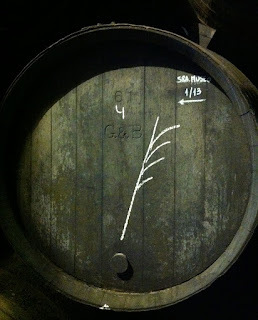 We tasted the barrel that gave us La Bota No 20, and our reaction inspired Cabo, the guy in charge of the Bodega when Eduardo isn't there, to draw off a bottle for us to leave with. 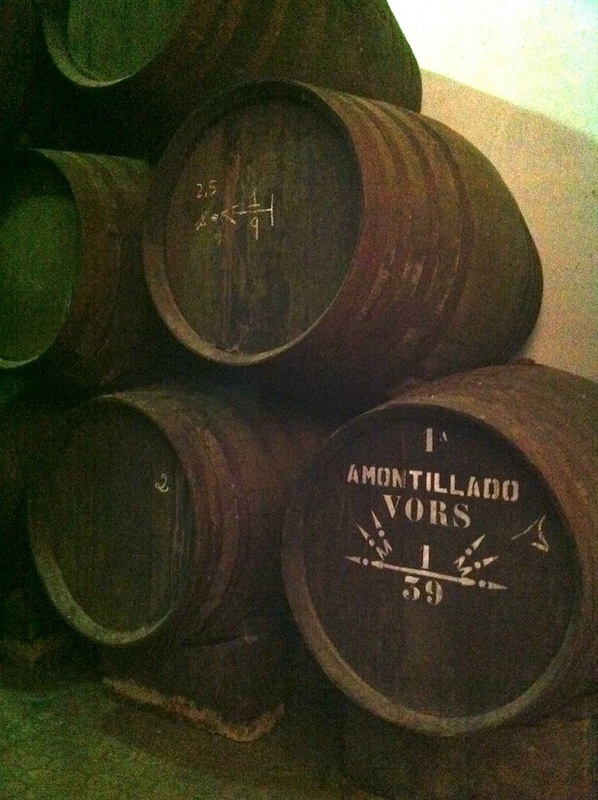 We tasted a hidden barrel of Amontillado, that little one above barrel 17, something that is not bottled. This is one of the great things about visiting a Sherry Bodega - if you are lucky you will get to taste special things, wines that the cellar master cares about but that will never see the inside of a bottle. Again, Amontillado made of Manzanilla wine can be very special, and this was absolutely one of the most memorable wines of the trip for me. 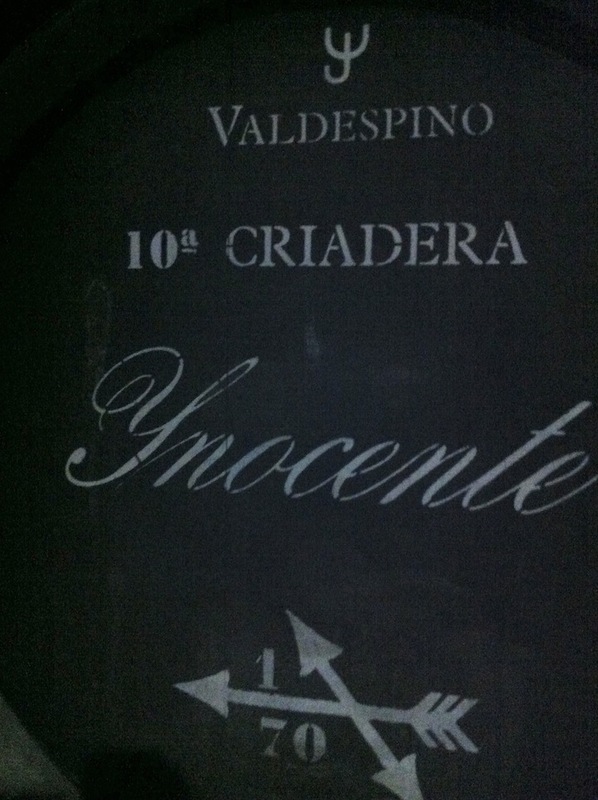 At Valdespino we tasted through many of the 10 criaderas of Inocente, several criaderas of Tio Diego, and and a few other great wines. Inocente is a Fino that comes exclusively from grapes from the Marchenudo Alto vineyard, one of the "Grand Cru" sites of Jerez. Tio Diego is what happens when Inocente becomes an Amontillado - not 30 years later, but very soon after it becomes Amontillado. What happens after Tio Diego? 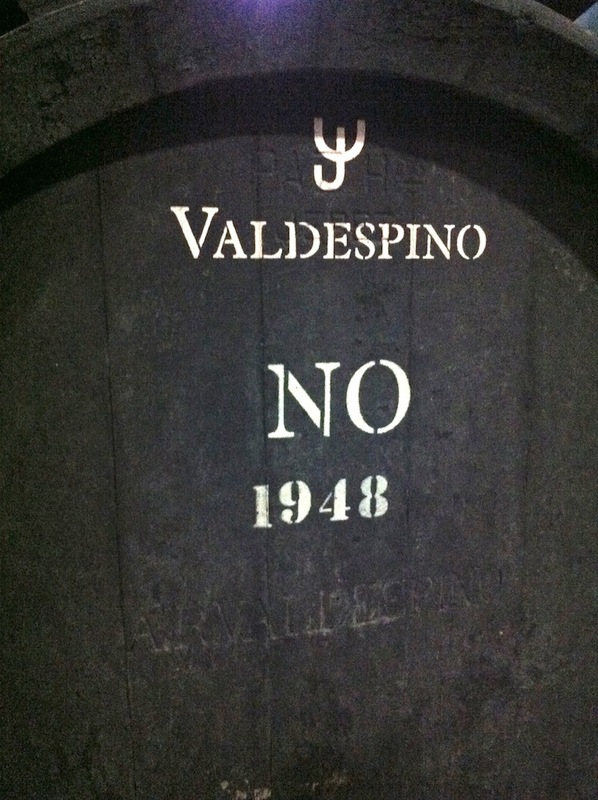 We walked to the section of the Bodega where a few very special wines age in barrel. 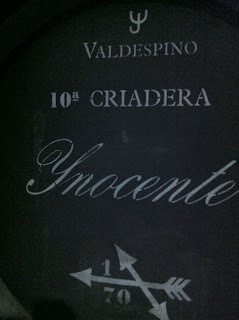 There is Viejo CP, a lovely Palo Cortado that originates as Inocente, a wine that is not imported in the US. 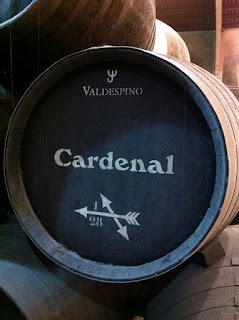 And finally, there is Cardenal, one of the great wines of Jerez, a very old Palo Cortado of which perhaps 400 half bottles are released each year. 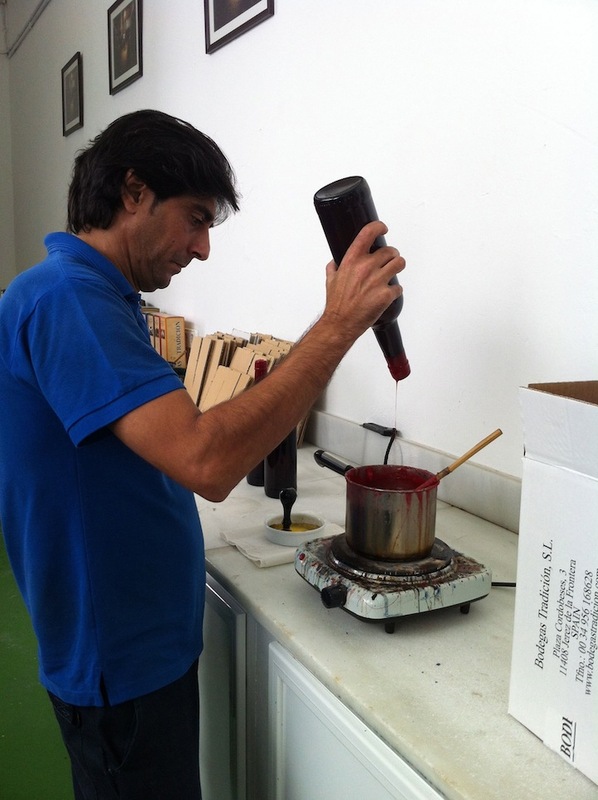 The Cardenal solera is fed by Viejo CP. 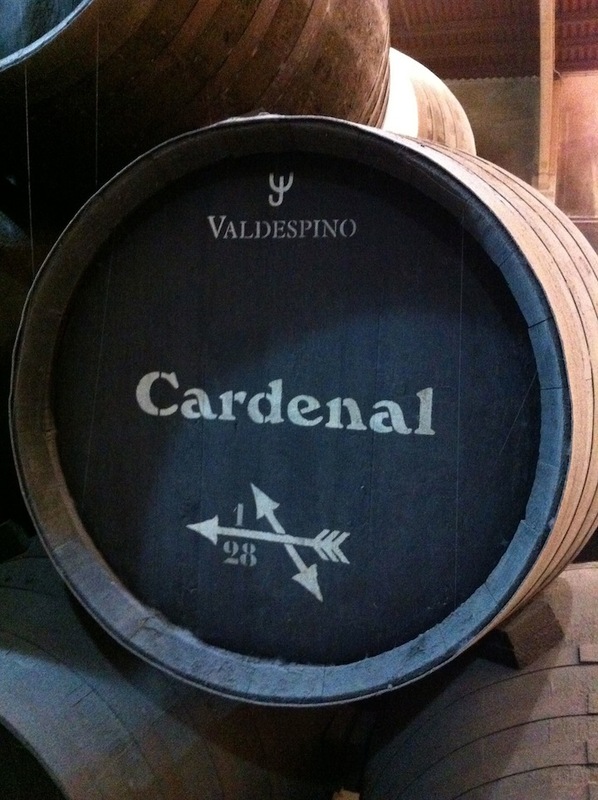 As it was first described to me by Peter, "Even seasoned Sherry buffs in Spain widen their eyes if a bottle of Cardenal is served." 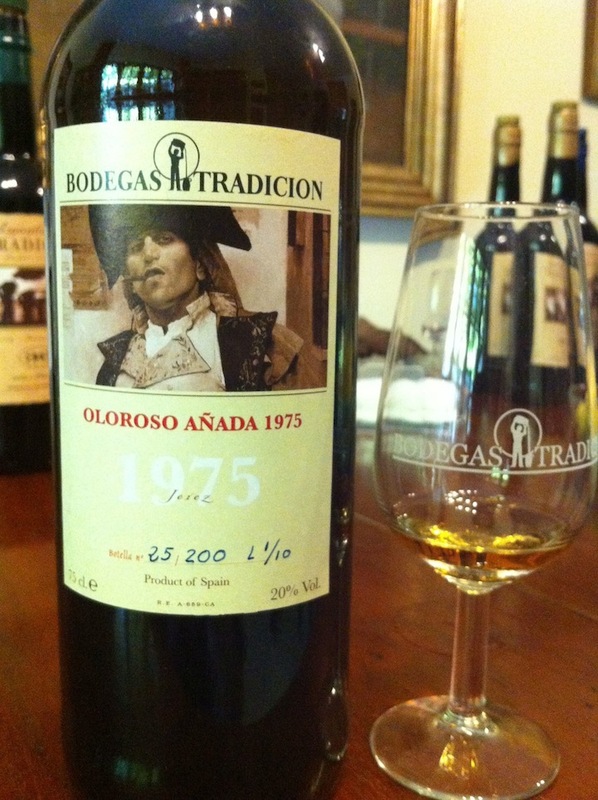 We tasted this wine next to Coliseo, a very old Amontillado that originates as a Manzanilla, actually. Both are superb wines of astounding depth and intensity, and also great clarity and articulation, and of seemingly unending length. I calculated 47 minutes on Coliseo, but honestly I just stopped counting at that point. These glorious wines are something like the Richebourg and La Tâche of Sherry, but they can be had for a fraction of the price. I should say they could be, if they were imported to the US. I'm starting to sense a pattern here regarding importation, or lack thereof, of fine Sherry. Are you? * Patently false. These are wine making tools. And Fernando Hidlago is an upstanding citizen who is well regarded in his community. 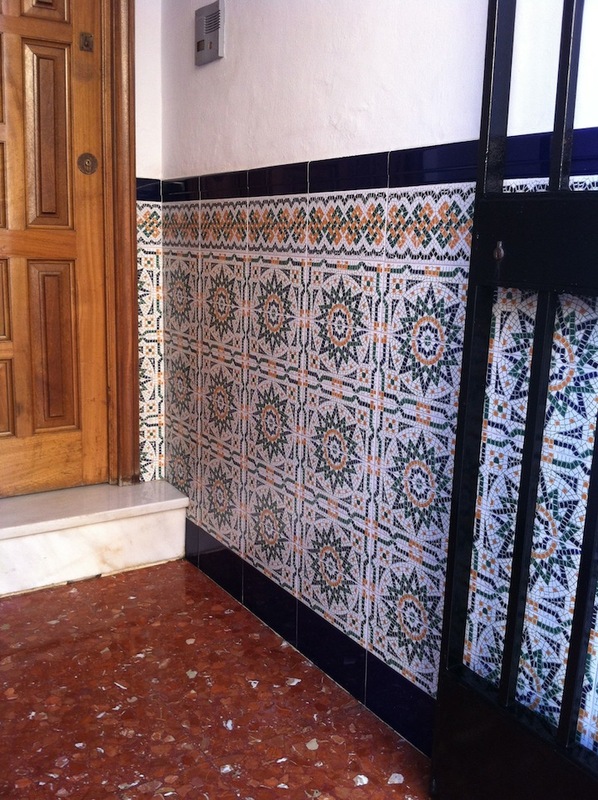 Southern Spain was ruled by the Moors for over 700 years until the end of the 15th century. 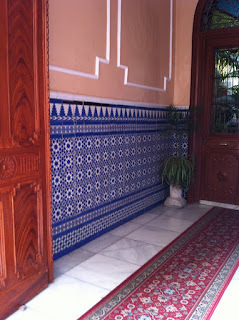 There are several cities in Andalusia where one can see magnificent works of Moorish architecture. Jerez is not among them, to my knowledge. 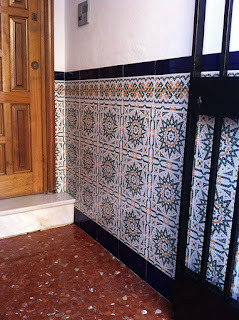 But there are traces of the Moorish past in Jerez. I noticed immediately, for example, that the entryways to many residences are beautifully tiled in the Moorish style. I cannot explain why these captured my attention so vividly, but they did. Maybe it's because they are beautiful. Maybe it's because I am an obsessive person. Whatever the case may be, I want to share some photos of these tiled entryways, because I like them. 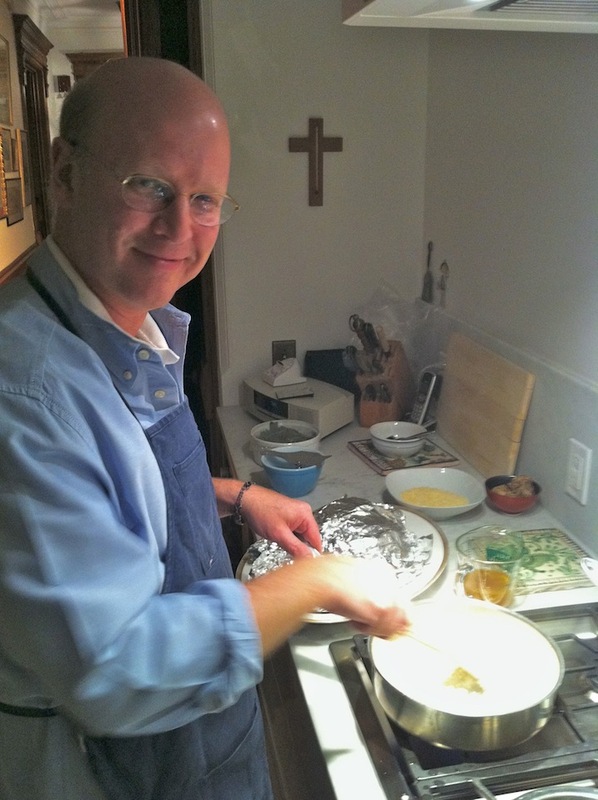 So yes, there is nothing about food or wine in this post. If that bothers you, have a snack or a small glass of Fino while looking at the photos. 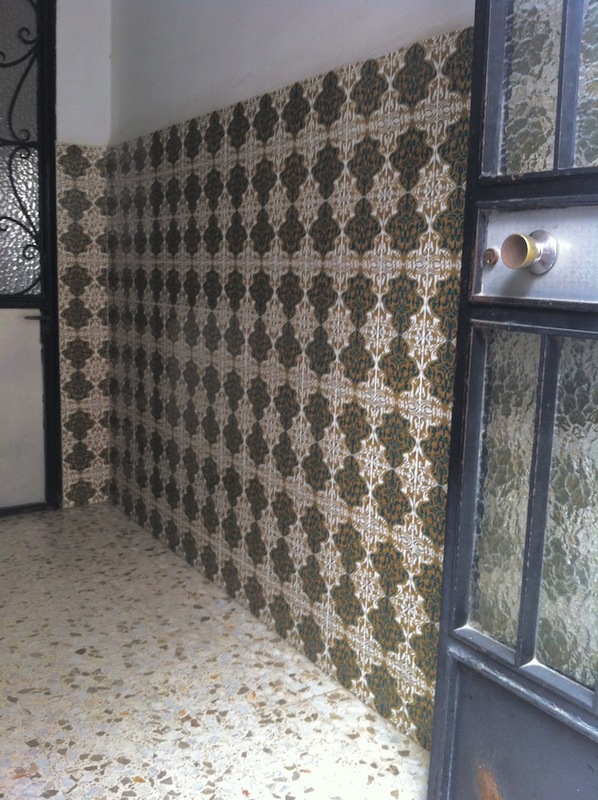 This one also was tiled. 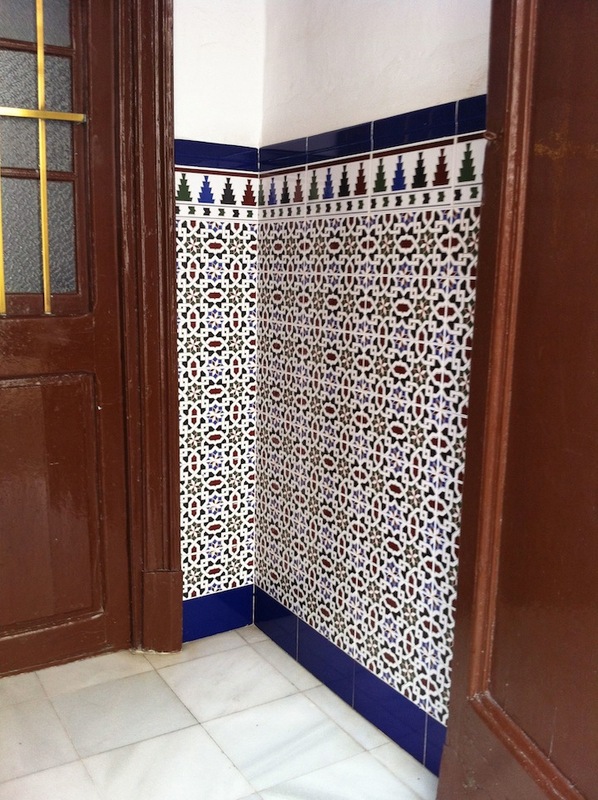 This one is not unusual, in that it was tiled. 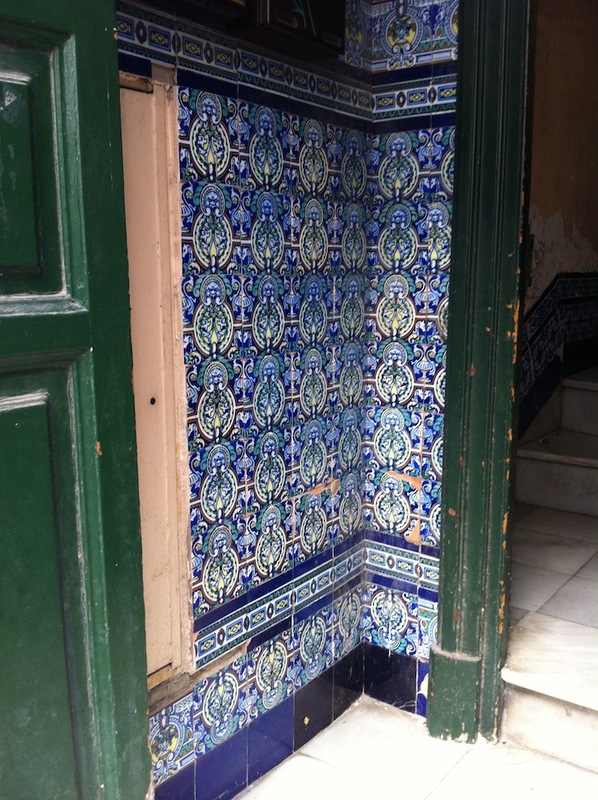 At this point, you cannot be surprised about the tiles in this entryway. What, you thought there'd be no tiles? 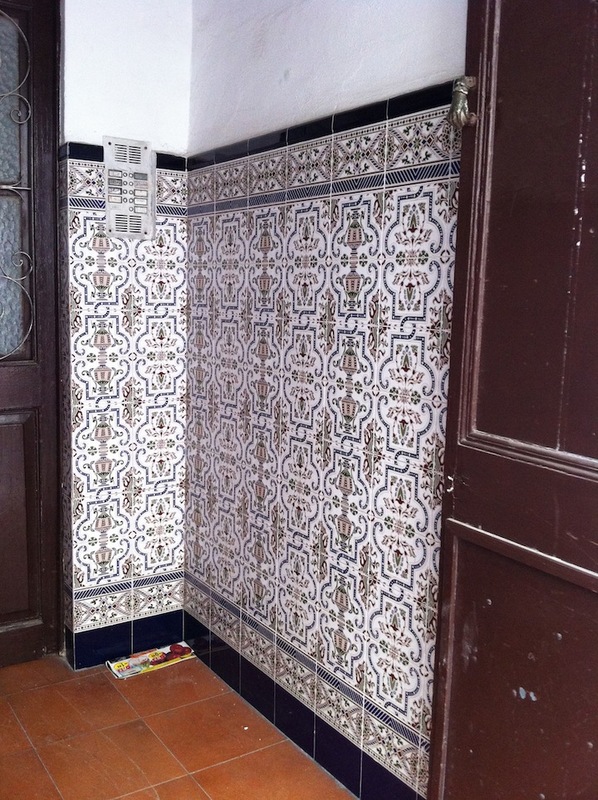 Tiled fireplace of old? A baker sells bread through that window. 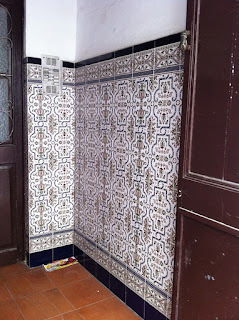 The designer here chose tiles for the entryway. This concludes this series. 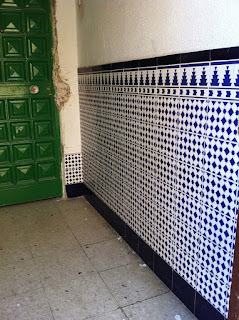 Notice that all of the entryways are tiled. 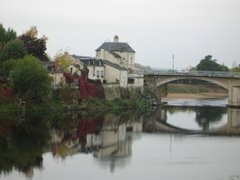 In Burgundy and the Loire Valley, it can be difficult to find the producers you are trying to visit. The houses look like any other houses and often the placards at the entrance are quite small. When you eventually find your way, you visit dark and cold underground caves with beautiful mold covered walls. There is enough room for wine barrels and not much else - visiting is an intimate experience. You taste through the lineup of new wines in barrel, and then perhaps a few bottles from recent vintages, maybe an older bottle if you are lucky and the wine maker feels like sharing a special experience. 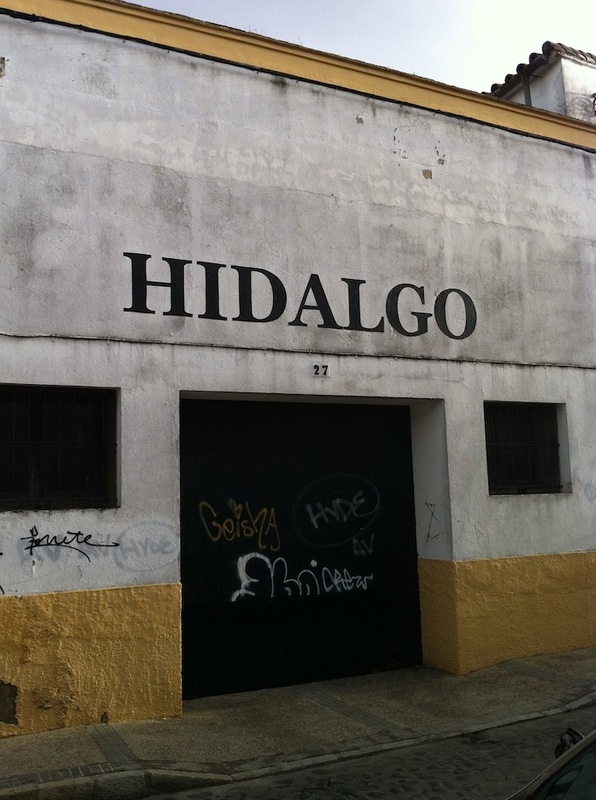 Entrance to Bodegas Emilio Hidalgo. Visiting a Sherry Bodega is quite different. 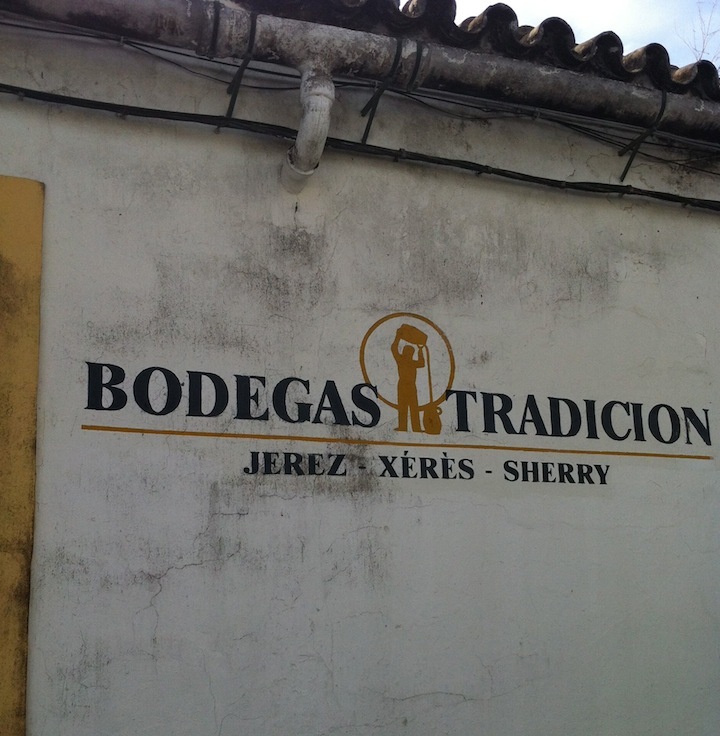 Sherry Bodegas, small and large, tend to be a bit easier to identify from the street. 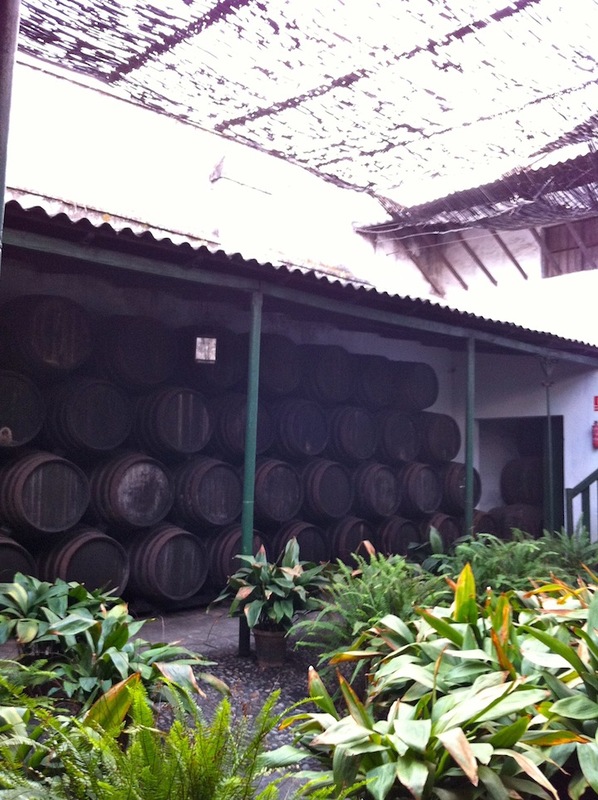 Bodegas are compounds - there are barrels rooms of course, but also courtyards with lovely plants and trees, and offices and all sorts of other buildings. 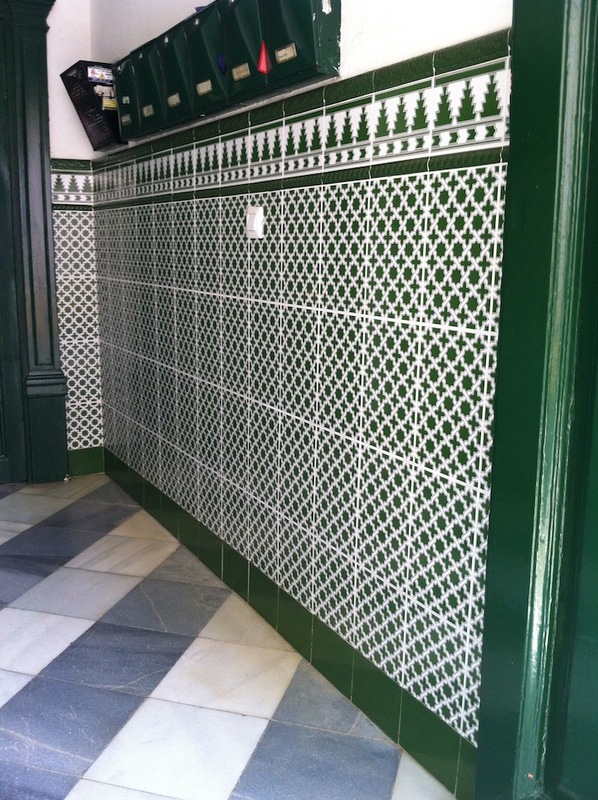 Inside Bodegas Fernando de Castilla. Honestly, the larger Bodegas seemed like walled cities with their own private streets, and what I think may have been medical clinics, schools, and libraries. Okay, maybe not, but it seemed that way to me. Oloroso barrels at Bodegas Emilio Hidalgo. Most of the Bodegas we visited keep some barrels in the outside air. 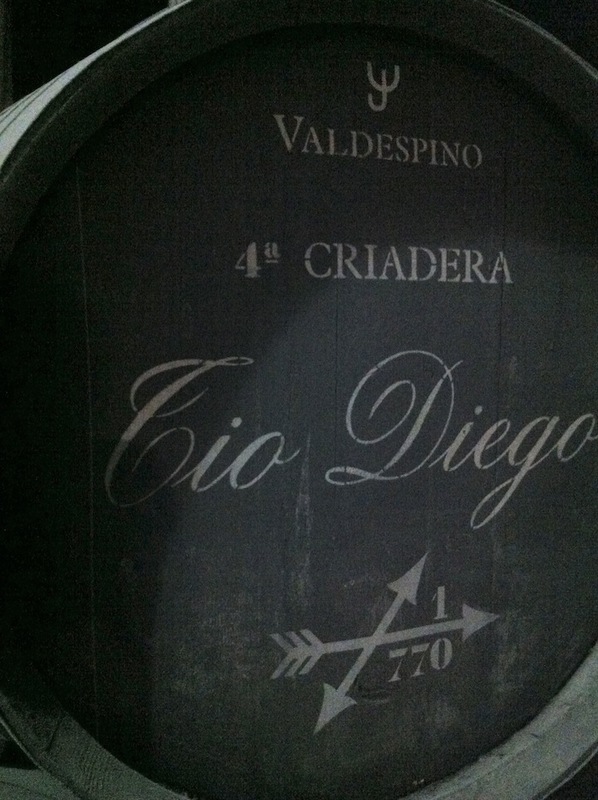 There are wines in these barrels - Olorosos, usually, wines that never see flor. They are able to withstand greater variation in temperature than biologically aged wines. Inside the Valdespino Bodega. It felt as though I had been swallowed by a whale. Walking into an actual Bodega, a barrel room, can be startling. 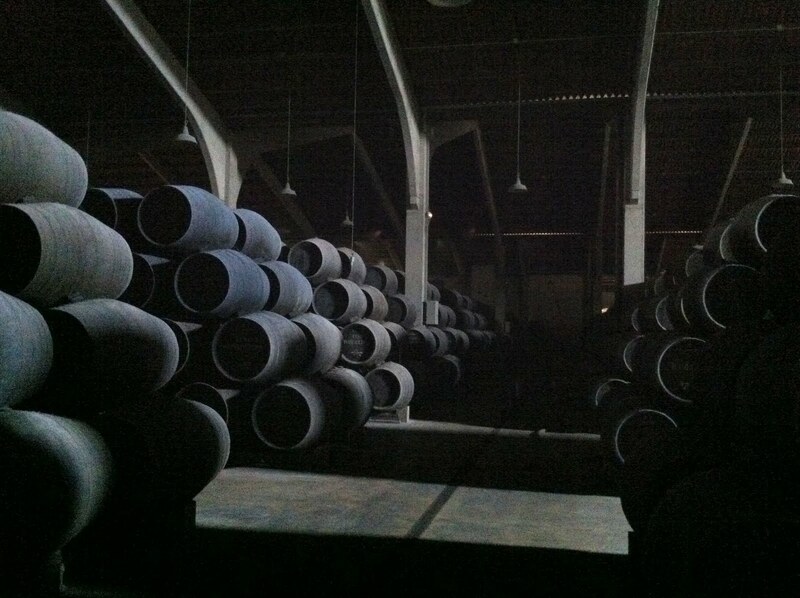 You step through a door (they are not underground) and into a vast dark room filled with barrels. Light pokes past the edges of frayed wooden screens that don't really cover the windows. The ceilings are very high. The air smells delicious, kind of like yeasty bread dough and toffee. 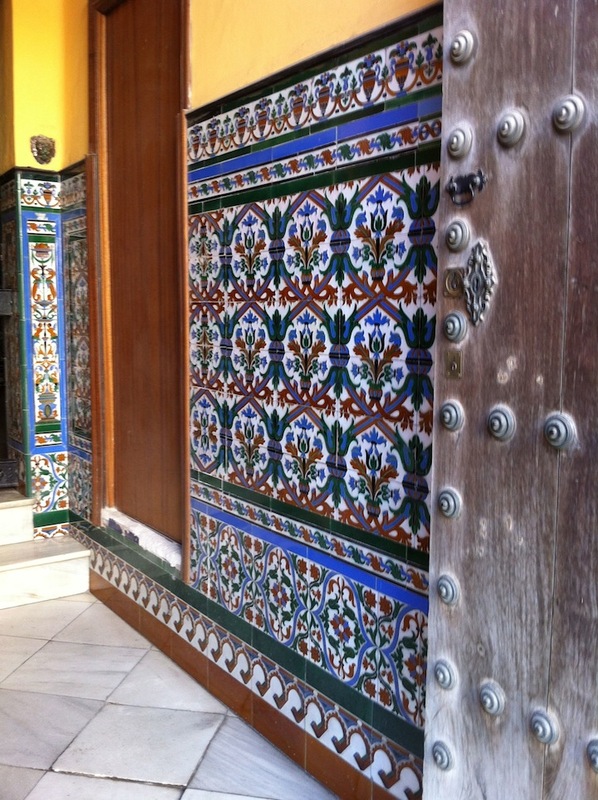 These are old, quiet, beautiful places that inspire great reverence. 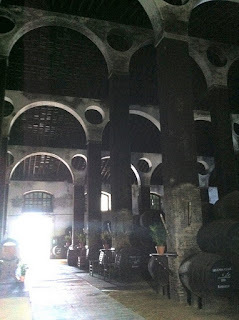 Inside the "Cathedral" at Barbadillo where Solear is matured. 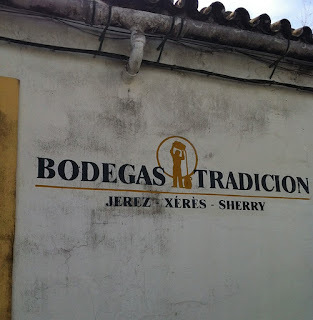 You do not taste finished wines in Sherry Bodegas. In Burgundy, for example, when you taste from a barrel you get a pretty good sense of what the wine will be. Sure, the wine you taste will be blended with other barrels of the same wine and it is unfinished in barrel, so you must interpolate a bit to understand what you are tasting. 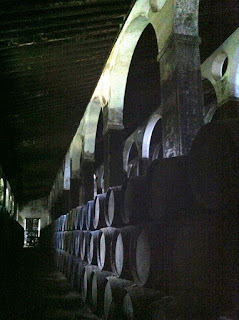 But in a Sherry Bodega you are tasting merely one ingredient of a wine, and at one moment in that ingredient's never-ending life. "1/70" indicates that this is barrel #1 of 70, in the 10th and youngest criadera. You begin by tasting from a barrel in a younger criadera, and get a sense of the wine as it begins. Tasting older criaderas, you get a sense of the wine as it matures, and so on. 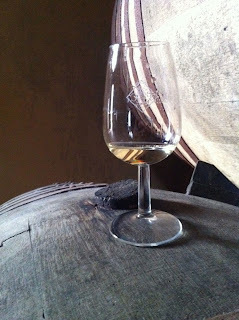 Even when you taste from the solera barrels you are experiencing but one version of the wine, the version that the cellar master wants you to see on that day, not the finished wine. None of these wines that you taste will ever be experienced in a bottle. They are, as Peter says, "photographs of a moment in time." When you emerge from visiting a Bodega, you leave with an understanding (hopefully) of the Bodega and what the wines can be, not so much of the wines as you might purchase them in bottle. 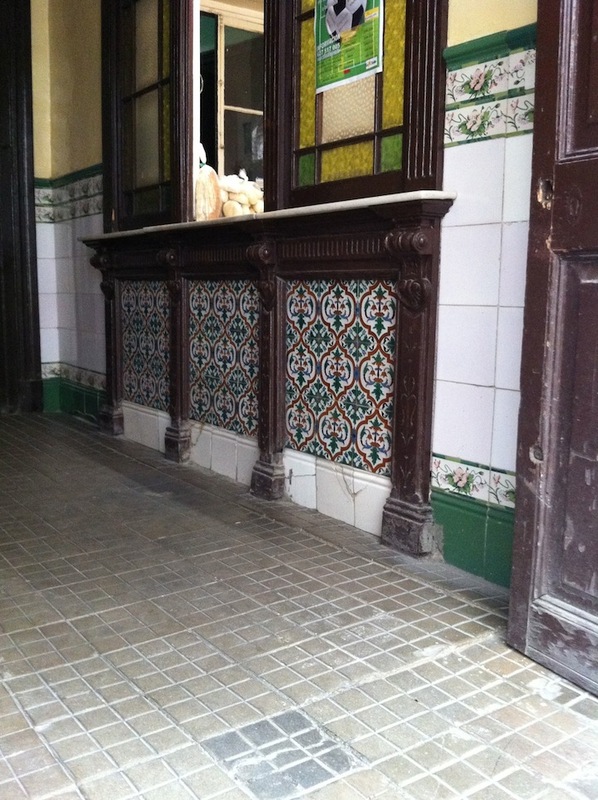 There are amazing, these old Bodegas, and they are an endangered species. I'm grateful that I had the opportunity to see them and to be with them for those few days.